G. Robles, E. Parrado-Hernández, J.A. Ardila-Rey, J.M. Martínez-Tarifa Multiple partial discharge source discrimination with multiclass support vector machines. Expert Systems with Applications, vol 55, pp. 417-428, August 2016. Abstract – The costs of decommissioning high-voltage equipment due to insulation breakdown are associated to the substitution of the asset and to the interruption of service. They can reach millions of dollars in new equipment purchases, fines and civil lawsuits, aggravated by the negative perception of the grid utility. Thus, condition based maintenance techniques are widely applied to have information about the status of the machine or power cable readily available. Partial discharge (PD) measurements are an important tool in the diagnosis of power systems equipment. The presence of PD can accelerate the local degradation of insulation systems and generate premature failures. Conventionally, PD classification is carried out using the phase resolved partial discharge (PRPD) pattern of pulses. The PRPD is a two dimensional representation of pulses that enables visual inspection but lacks discriminative power in common scenarios found in industrial environments, such as many simultaneous PD sources and low magnitude events that can be hidden below noise. 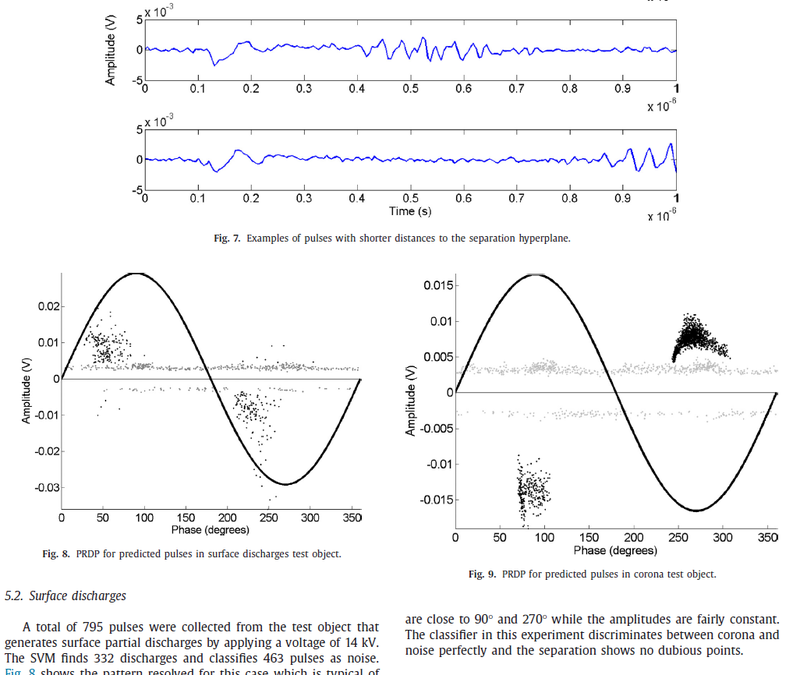 The literature shows several works that complement PRPD with machine learning detectors (neural networks and support vector machines) and with more sophisticated signal representations, like statistics captured in several modalities, wavelets and other transforms, etc. These methods improve the classification accuracy but obscure the interpretation of the results. In this paper, the use of a support vector machine (SVM) operating on the power spectrum density of signals is proposed to identify different pulses what could be used in an online tool in the maintenance decision-making of the utility. Particularly, the approach is based on an SVM endowed with a special kernel that operates in the frequency domain. The SVM is previously trained with pulses of different PD types (internal, surface and corona) and noise that are obtained with several test objects in the laboratory. The experimental results demonstrate that this technique is highly effective in identifying PD for cases where several sources are active or when the noise level is high. Thus, the early identification of critical events with this approach during normal operation of the equipment will help in the decision of decommissioning the asset with reduced costs and low impact to the grid reliability. Keywords – Support Vector Machine, Partial Discharges, Electric Maintenance, Machine Learning, Condition Monitoring, Risk Assessment.